By understanding the needs of your customers and the value that your e-business offers (the value proposition), you can communicate to your customers that you have what they want to buy — and what they’re willing to pay for. Use the questions shown in the example form to determine why customers come to your website and what value they receive. 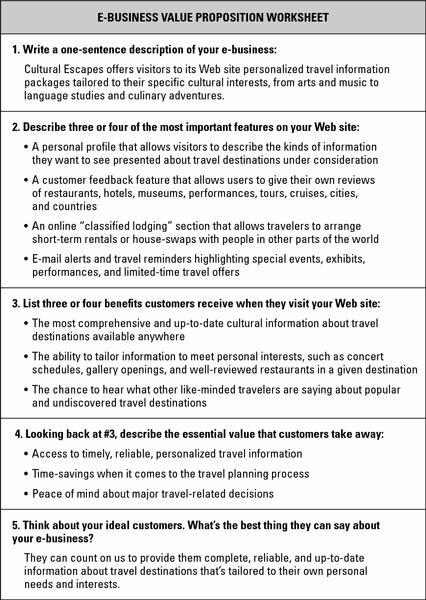 The figure shows how a travel-related site called Cultural Escapes completed the form. Challenges faced by the company: The company’s responses show that customized information is a hallmark of the business. But to be useful — and to keep customers coming back — the site’s information absolutely, positively must be right on the mark. In other words, if a customer has one bad meal at a favorably reviewed restaurant, the site loses one of its principal values to customers. This realization may lead to a quality control division that monitors reviews on an ongoing basis. Features that offer revenue-generating potential: By realizing the unique value Cultural Escapes offers to customers, the company may develop some of its features into revenue-generating products. For example, a traveler who’s planning a trip to Barcelona and happens to be passionate about great food and culinary culture may be willing to pay a small fee for a customized package of information that includes hot new restaurants in the city, cooking school courses, and background on the city’s culinary history. This same customer may also be willing to pay for a subscription to a monthly newsletter that highlights upcoming culinary events in major cities around the world. In addition, because the website attracts visitors interested in food, travel, and culture, it may be attractive to businesses that want to advertise cooking schools or culinary events — even cookbook publishers or food magazines. By developing its value proposition, the travel site can build a promising business model that includes a number of revenue streams: fees for personalized travel-information packages; subscription fees for special interest travel newsletters; and revenues for site ads placed by companies with related products or services.